Some things from your youth flow into becoming part of the family culture you build with your children. From earliest childhood I was taught to stay out of the way. Doctors have their “first do no harm” principle and farm kids have their “first get out of the way” maxim. You don’t have to be doing the most important chore so long as you aren’t hindering the person who is. My boys aren’t farm kids, but I try to stress this awareness. I can’t teach staying out of the way as well as an 800 pound bull can, but I try. Other parts of your upbringing you reconsider with your own children. I grew up in a non-huggy, non-kissy environment. My wife, who has far fewer Germans in her lineage, is all hugs all the time. While I am still not a confident hugger of adult people, I’ve adopted her system with our children. I can’t imagine not hugging and kissing our children every day; it’s become so routine now for me to do it. Also, our children will not suffer themselves to be robbed of their rightful hugs and kisses. Mommy’s warm blood seems to have conquered my aloof genetics within them. They are the affection police. At bedtime I have to give three hugs and three kisses to make the world right for sleeping. Big Man’s kiss is actually a carefully choreographed series of kisses. He takes my head firmly between his hands and stamps my lips upon his face as he turns his head side to side. If I pull away before the process is complete, we have to start over. The same goes for Mommy. This old picture of them kissing each other is more appealing than a new picture of them kissing their crusty old dad. At 3 a.m. one morning I awoke to a boy standing beside my bed. I expected to hear the sad tale of a bad dream. Instead I heard mournful reality. “You didn’t hug me when I went to bed,” Buster lamented. That is, I didn’t hug him to his satisfaction. The midnight raid was just so I understand who is privileged to interpret the law. Going to work is another ripe occasion for hugs and kisses. There is a program for this as well. Big Brother gets his at the table where does his reading. The little boys go to the door. Big Man is very particular about where he gets his hug and kiss. He will position me at the threshold if I am lax in my staging. Mommy is last to get her kiss. Once, when I gave her only a quick peck, Big Man stepped forward, giving me a stern glance. “And a hug,” he demanded. I gave Mommy a proper hug and was allowed on my way. Big Man isn’t always pro-hug. If I hug Mommy too long when neither of us is going away, he steps in to break it up. He doesn’t know where it might lead, but as reigning baby of the family, instinct tells him it could be dangerous. 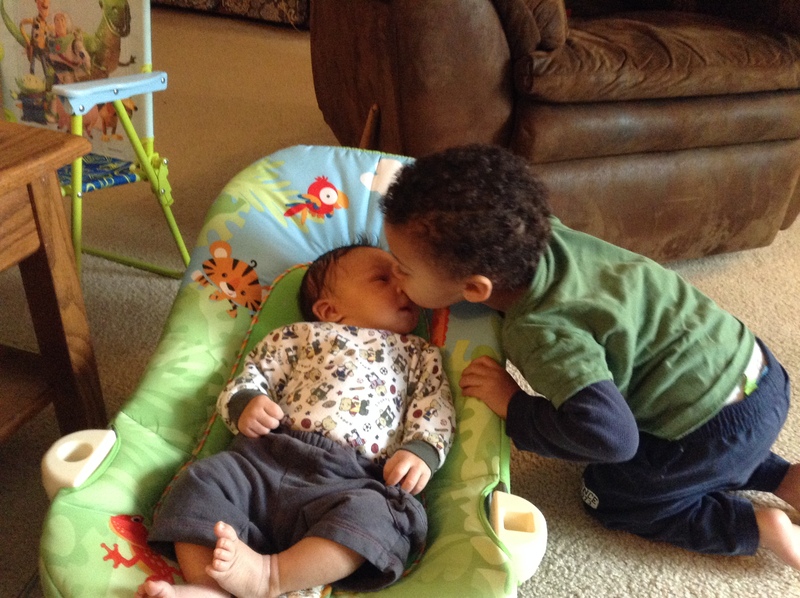 This entry was posted in Little Weirdos and tagged affection, boys, brotherly love, brothers, children, family, fatherhood, hugs, humor, Sons. Never stop giving those hugs, regardless of how old your kids are. I hope that the affection police remain vigilant in their years to come. Eventually they will have to show up at the nursing home if they want their hugs. That will be the true test. Yes. We have our best man on it. He’s a quick study with strong little arms. I am ALL about the hugs! Good job! I grew up in a very huggy family and was fortunate enough to marry a huggy guy. In fact, I’d like a hug right now. Dammit, I’m home alone. My wife hugs everybody, whether they want it or not. It’s really amazing to see. I’ve cut back on hugging in recent years, but I try to maintain a house policy of hugging all visitors. Probably makes more sense than hugging random people on the street. I love hugging my kids because there’s no awkwardness. With adults, it’s sometimes hard to tell who is getting ready to swoop in for a hug and who is keeping their distance. Wow, you’ve got little hugging bandits! A fierce group of Hugging Banditti for sure. We’d be hugging in a bigger house. There’s gotta be a way.. I could hug a better job. There you go. Another world problem solved and all it took was a hug. Thank you, Amy. Having a hug-happy family has certainly warmed my disposition.